Henry “Son” Simms—the Delta blues fiddler and guitarist who recorded with the eminent Charley Patton in 1930 and McKinley “Muddy Waters” Morganfield in the early 1940s—was thought to have been buried in an unmarked grave at Bell Grove Baptist Church Cemetery in Clarksdale, Mississippi. 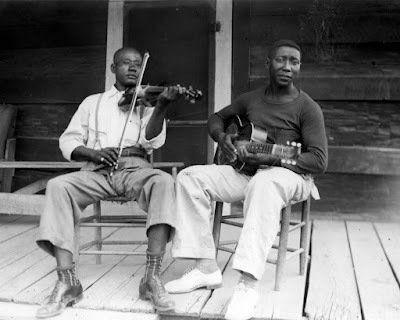 According to Gayle Dean Wardlow, who interviewed former associates and relatives of the blues fiddler, Simms experienced “acute bladder problems” in the late 1950s, and he went through “surgery on three occasions,” the last of which he did not survive. The World War I veteran from Anguilla and Delta blues fiddler died at the Memphis VA Hospital on December 23, 1958. [i] His death certificate reveals that Memphis funeral directors R.S. 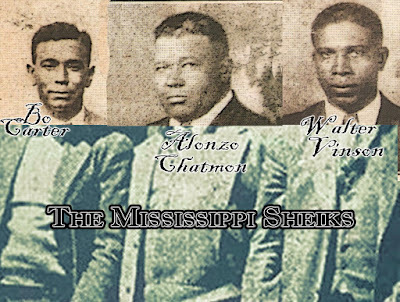 Lewis & Sons prepared the body of Simms for travel so that his wife of more than a decade, Lizzie Simms, could remove his body for burial in Clarksdale. [ii] The document lists no “name of cemetery or crematory,” but recent discoveries reveal that it was, in fact, not Bell Grove Baptist Church Cemetery. Two other names appear on the headstone application: Henry Hudson, who signed his name and appears to have filled out the document, and Nanettie Harris, the cemetery sexton, official, or superintendent. The Clarksdale city directory lists Hudson’s occupation, in various years, as postal carrier, driver for the post office, and messenger. He was, therefore, most likely an acquaintance of Lizzie Simms who helped her complete the application and, perhaps, possessed the means to transport the headstone upon delivery. Shufordville Cemetery official Nanettie Harris had worked as a teacher at Lyon School in the late 1940s and early 1950s. She later worked as a maid at the Brandon Clinic while living at 207 Hopson Street in Lyon. [iv] It was Harris who apparently authorized the installation of Simms’ headstone. Moore sent a copy of the headstone application to Euphus Ruth Jr., a Greenville-based photographer, tapophile and MZMF board member, who set out to locate the long hidden and neglected grave marker of Simms. 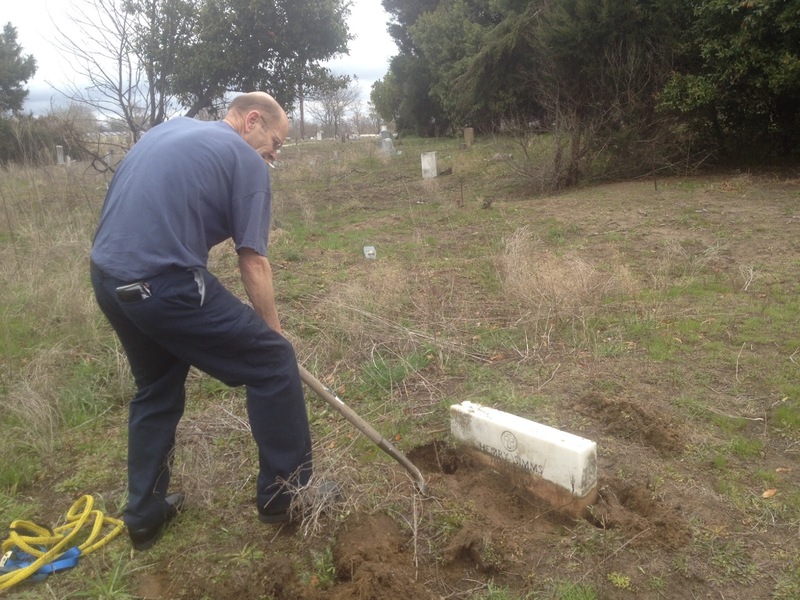 He contacted Coahoma County blues enthusiast and local historian Robert Birdsong, some of whose descendants were buried in Lyon at historic Shufordville Cemetery. Believing it the burial ground referred to in Simms’ headstone application, the two men visited the large cemetery on March 28. Ruth walked around in the black section of the graveyard looking for markers from the late 1950s, and he located an upright, white marble headstone bearing the name “Hemry [sic] Simms.” It had sunk into the ground over the past fifty years so much so that only the name remained visible. Birdsong, therefore, retrieved a shovel and removed the dirt from around it, revealing his status as an army private during World War I and his correct birth and death dates—August 22, 1890 to December 23, 1958. All the information on the marker corresponds with that given on the application as well as his death certificate—except, of course, for the misspelling of his first name. To get to the headstone of Simms, head west on Shufordville Road and turn left after passing the sign for Shufordville Historical Cemetery. Park at the gate and follow the road to the right, leading to the back side of the graveyard. Locate the mausoleum of Dr. P.W. Hill and walk an estimated forty yards from the rear of the mausoleum towards the fence. 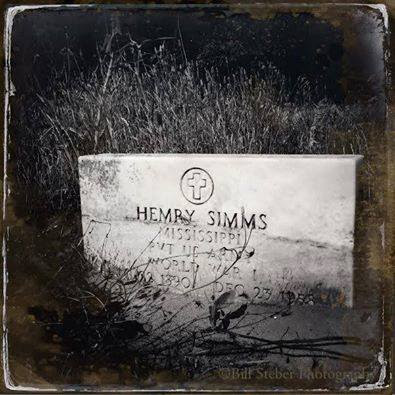 Facing the fence sits the white marble military grave marker of Delta blues fiddler Henry “Son” Simms. [i] Gayle Dean Wardlow, “Henry ‘Son’ Simms,” 78 Quarterly 9 (1995): 11-18. 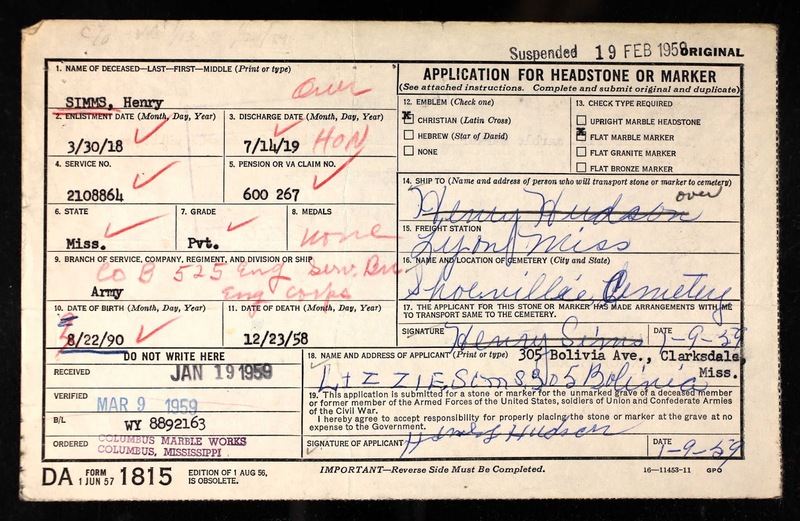 [ii]“Henry Simms,” Tennessee, Death Records, 1908-1958 [database on-line]. Provo, UT, USA: Ancestry.com Operations, Inc., 2011. 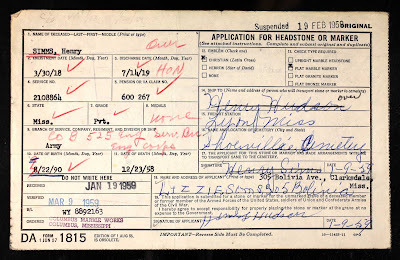 [iii] “Henry Simms,” U.S., Headstone Applications for Military Veterans," Ancestry.com, 2012. [iv] 1946, 1951, and 1953 Clarksdale, Mississippi City Directories.